Best house edge at just 0.7%, great user interface and an awesome invest option! When it comes to cryptocurrency dice games, the internet abounds with websites and platforms that are ready to provide their solutions to anyone who will have them. However, much like most aspects in life, the notion of quality over quantity holds true in this sense as well. Just because there are more providers available in this space does not mean that their services will all be great. But this creates another problem: the more sites that are available for dice games, the difficulty it gets to pick those who stand apart from the crowd. That is why, whenever we find a provider that gets to achieve that feat, we cannot help but write gleefully about it – since the dice games space needs all the great providers that it can get, so interested players could enjoy services that truly stand out from others. DiceBet is one such provider that offers propitious services to all its players, and ensures that they can enjoy cryptocurrency dice games in a safe and fun environment. So what does it do that that makes it so discernible within a slew of dice game platforms? First and foremost, the one thing that you need to ensure the availability of in a dice game is its ability of being provably fair. Briefly put, provably fair means that the game remains verifiable for its non-bias towards the provider and the player, providing them with equal grounds during the game. In a provably fair setting, the dice generation remains unpredictable by every means, with the provider having no idea what it might be. The algorithm itself is available to be reverse tested by anyone, which adds to the credibility of the platform. 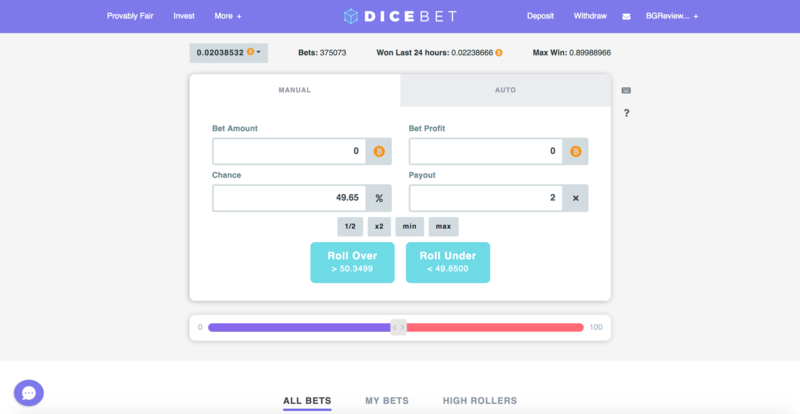 DiceBet is provably fair and has its algorithm remaining to be verifiable to its users, ensuring that their bets are being placed in a setting which provides no biased edge towards the “house”, which in this case gets to be DiceBet. The second part which makes or breaks a dice game for its users is its house edge. Most online betting and dice game sites charge a house edge which is more than the affordable amount for those users who are placing small bets every day in order to be able to truly enjoy their game. Whereas, DIceBet allows them to make the most out of their funds by charging a very low house edge of 0.7%. DiceBet also sports an interface that remains aesthetically pleasing yet easy to use, which once again makes it stand out of the crowd. The platforms accepts Bitcoin, Litecoin and Ethereum for deposits and payouts, and makes sure that their wallet addresses and deposit instructions are displayed clearly, with withdrawals only being on the reach of the click of a button. The dice game interface also allows various playing options that could remain enjoyable by both seasoned and new players alike. DiceBet has a bankroll that is publicly funded. This means that the site is funded for the users, by the users, which makes sure that DiceBet continues providing solutions that would be enjoyed by its players who are not just coming to the platform to play but also serve as its lifeblood. Users who invest in DiceBet’s bankroll actually benefit from the action themselves. By investing in the site, they get to share in its profits, with the payout being proportionate to their investment and the other number of players on the site. This also provides them with “Investment Leverage”. In its traditional setting, the maximum winning bet for a single user is always just 1% of the bankroll. That means that if the bankroll is 1000 Bitcoins, then a user can win up to 10 Bitcoins in a single bet. But for investors, that leverage changes and their winning amount increases should they choose to use that ability. 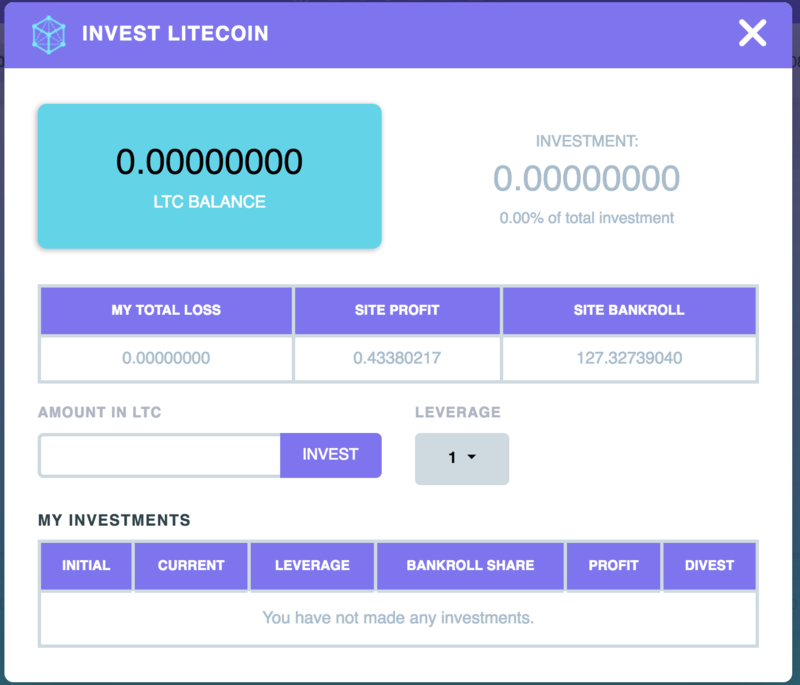 They can instead bet using a betting amount and their investment leverage, which could lead to them not only getting the profit payout, but also getting to increase their investment in chance of a win. More details on the investment platform can be inquired by the DiceBet team. Who, by the way, remain readily available for its users. Apart from all of these great features, DiceBet also has a dedicated team that comprises of talented and tenured individuals from the cryptocurrency industry. Together, they have not only built a site that ensures great user experience, but they also make sure to provide great customer service with it by being available for their users as a customer service team. So in case you have a question about the game or about the site itself, all that you have to do is to reach out to them, and you will find your inquiry being answered in a timely manner. By paying attention to core features, DiceBet has created a safe, fun, and overall enjoyable site for players of all types, whether they are large scale bettors or casual gamers. One thing that gets to stand out for not a very good reason is the site’s background color. The shade of turquoise might be too bright for some, but to be honest, you only notice that if you are very picky about appearances. Overall, the site remains a great fit for everyone. So if you are someone who enjoys dice games, then you might very well appreciate this new addition.